I've been feeling uninspired lately when it comes to blogging. And I'm blogging about it. Which is kind of like saying I'm not thirsty while sipping a frost beverage. Maybe it's because most of my energy an free time lately has been devoted to my current WIP. I'm currently 35K+ words in (wrote 5K yesterday alone) and loving it more and more with every word. Honestly, I don't even know what prompt we're on in the challenge...but it doesn't really matter anyway since a lot of the recent posts really don't apply to me as a mostly unpublished writer. Isn't that cool? It's old typewriter keys. And it's perfect, since I am, in fact, a writer. I have to get used to saying this out loud and sharing it with my world. It's easy to do in my head. Not so easy out loud. I AM A WRITER. Four little words; easy to pronounce, even. But for a person who doesn't share much of herself to begin with (though this is changing quite a bit as I get older), it's going to take a bit of work. But hey, I'm just about used to typing one one space instead of two. Maybe it isn't so hard to teach this dog a new trick. So to everyone in the challenge (and otherwise)...happy blogging. And keep on keepin' on. You are resilient. Good on ya! You ARE a writer, Jen. And a good one, at that. Happy firing (and re-firing)! Amazing how things work out....and though it's a cliche, everything does happen for a reason! 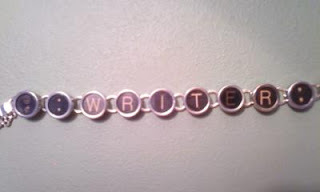 Keep on writing! You GO girl! I'm glad to hear wonderful things happened through not-so-wonderful things. Karma has her way :) WRITE ON!